DIRECT/INDIRECT is a two-part system consisting of a formulation-matched film and emulsion. The film assures excellent print quality, the emulsion assures excellent durability. The proecess is inherently stable with predictable results. 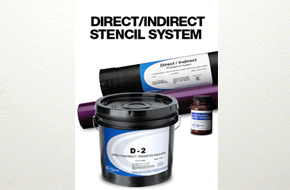 Direct/Indirect is a fast, easy-to-use stencil system for use with UV, plastisol, and solvent-based inks.